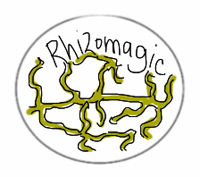 Are you in charge of ALL of rhizo14, i mean, all around the world? You see I received a box in the mail yesterday that had a card, 4 t-shirts and a magnet that said #rhizo14 on it. 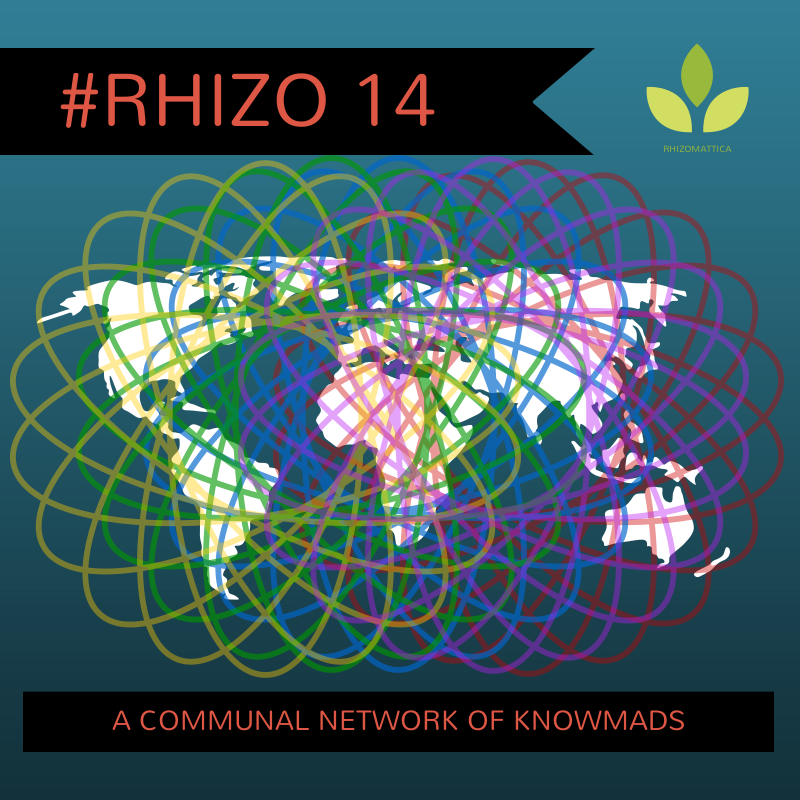 The artwork, the hashtag and the tagline “A communal network of knowmads” come from a Open Course that I started in January of 2014 now called #rhizo14. The package oscar was looking over had a stamp from Brazil on it which I explained came from Clarissa, an educator who participated in Rhizo14. She sent everyone in the family a t-shirt with the rhizo14 logo on it. So… are you in charge of it? My son not being accustomed to me being lost for words, was confused by my lack of response. In that simple question lies much of what I have struggled to explain about the event that is/was #rhizo14. What does it mean to be ‘in charge’ of a MOOC? What was my role in something that was very much a participant driven process? I say “now called” because the original title of the course was “Rhizomatic Learning – The community is the curriculum” but the people who are still participating refer to it by the hashtag. It was a six week open course hosted on the P2PU platform from January 14 to February 25th. The topic of the course was to be about my years long blabbing about rhizomatic learning. I wanted to invite a bunch of people to a conversation about my work to see if they could help me make it better. Somewhere in the vicinity of 500 people either signed up or joined one of the community groups. Fundamentally i was hoping that 40 or 50 people would show up to the course and that by the end there would still be a handful of people interested in the discussion. I thought it would be a good opportunity for me to gather the work that I had done and make it better than it was before. I find the pressure of having an audience is very helpful in convincing me to get things together. I was not precisely hoping that we would get enough people for the course to have MOOC like characteristics, and I certainly didn’t put the time into advertising it in a way that was likely to lead to that. I was hoping that after 6 weeks I would have a better grasp on my own work, and that a few participants would have had a positive experience. In the more macro sense, I’m always hoping that a course that I’m working on leads to some sort of community. My work since 2005 has focused on ways to encourage people to see ‘the community as the curriculum’. I’m always hoping to organize an ecosystem where people form affinity connections in such a way that when the course ends, and I walk away, the conversations and the learning continues. I made three different attempts at designing rhizo14. The first was around my own collection of blog posts about rhizomatic learning. This was, essentially, the content of 7 years of thinking about the rhizome in education, broken into six week. In retrospect, it seems difficult to believe that I was considering so instructivist an approach, but it is very much following previous models of open courses I have been involved with. I think that this course design was prompted by my concern that people would be unfamiliar with the use of the rhizome in education and would need structure to support their journey with the idea. It was also easy to just use the stuff I already had :). Two days later, I had almost completely discarded this model for a new one that was more focused on the process of learning and connecting in an open course. The idea in model two was to ‘unravel’ the course from a fairly structured beginning to a more open and project based conclusion. This design was meant address my concerns about new participants to open/online courses. Over the years we’ve seen many complaints about the shock of a distributed course and, I’ve always thought, we didn’t see the vast majority of the complaints of participants who just couldn’t get their feet under them. Two days before the course started, I threw that out the window as well. In discussions with the excellent Vanessa Gennarelli from P2PU she suggested that I focus the course around challenging questions. It occurred to me that if i took my content and my finely crafted ‘unravelling’ out of the way I might just get the kind of engagement that could encourage the formation of community. The topic I chose for week 1 mirrored the opening content i was going to suggest but with no readings offered. I gave the participants “Cheating as Learning” as a topic, a challenge to see the concept of cheating as a way of deconstructing learning, and a five minute introductory video. This is the format that I kept for the rest of the course, choosing the weekly topics based on what I thought would forward the conversation. Saying that I lost control of the discussion creates the false premise that I ever had control of it. From the get go, participants took my vague ‘cheating’ prompt and interpreted it in a dozen different ways. There were several strands of ethical debates regarding cheating. There were folks who decided to discuss testing. Others focused on how learning could be defined in a world of abundance. Still more took issue with the design of the question and focused on this. My response was to (as i had promised) write a blog post explaining my intention with the question and surveying what people had written. This was the only week that I did this. As the course developed, and new challenges emerged, it became clear that these review posts were being created without my help. They were, in essence, me trying to hold on to my position as the instructor of the course. A position I had not really had from day 1. By the end, I only formally participated as instructor in posting the weekly challenges with a short video and by hosting a weekly live discussion on unhangout. My ‘planned’ course finished on the 25th of February. On the 26th of February, week 7 of the course showed up on the Facebook group and the P2PU course page. This week entitled “The lunatics are taking over the asylum” was the first of many weeks created by the former ‘participants’ in the course. This new thing, which it is now safe to call #rhizo14, is currently in week 11 of its existence. In week eight, the community chose a blog post that I wrote several years ago as a topic of discussion. Week 11 is addressing the concern of allowing all voices to be acknowledge (a discussion that was very much present during the first six weeks) in an open environment. As they began so they continued. The vast majority of the people who participated are now only distantly connected to the course if at all. A core of 50 or so people remain in the discussions, however, and are now identify themselves as ‘part of rhizo14’. For now, at least, there is a community of people who I am happy to number myself a member of. Uh… no. I don’t think I ever was. An amazing group of people from around the world decided to spend some of their time learning with me for six weeks. A fair number of those seem to be forming into a community of learners that are planning new work and sharing important parts of their lives with each other. We are creating together. Hi Dave, nice post. It would be so enjoyable to me if my 20 and 17 year old sons would ask me anything about my work. I believe it’s fair to say that you instigated #rhizo14. What happened when colleagues, friends, and strangers accepted the call to participate, debate, contribute, question, examine and explore with you was out of your hands. It’s obvious in the turnout and the work that your idea matters. Nice to have it confirmed I imagine. Oscar probably doesn’t need much of a speech to understand what it means to be an instigator, or to understand the importance of being one, he’s grown up with two very fine examples. Great question by Oscar. That’s what the little people can do, they still can ask the ‘big questions’ of life. In my view, you for sure were the catalyst, you helped to start the fire. The fire is now still burning. And even when discussions in FB or in G+ go out like a candle, thoughts in people’s minds will go on. The Rhizome has no beginning, no end. It always starts in the middle, the middle where each of us individually ‘is’. Great post Dave. I am not sure who was in control, learning? It was a kind of leaderless leadership. Definitely changed the way I think about learning, the classroom, possibly everything. Thank you again for at least being one of the instigators for #Rhizo14. Well, yes, you were the leader. You made the call, and you made it loud enough that people were willing to heed you. We have to abandon the idea that leaders tell others what to do, that leaders have to be in charge; rather, leaders are those who encourage others to get up and move from where they are—perhaps to some place better, though often not—still, to some place new. And this call can be negative, as when Rosa Parks was just too damned tired to move to the back of the bus in Montgomery, Alabama. The simmering civil rights movement heeded her call and responded, spawning many other leaders, some even greater than she. Well, okay, you may not be in charge of Rhizo14, but you are the leader. It’s good. I really like the way Keith defines leaders. And, yes, Dave, I agree with him that you were/are a leader in rhizo14. What has the concept of leadership become in a flat world such as ours at this day and age? Instigators? Maybe… and you were/are quite an eloquent one.